After having typically appeared in the hallowed pages of Baseball Think Factory, Dan Szymborski’s ZiPS projections have now been released at FanGraphs for more than half a decade. The exercise continues this offseason. Below are the projections for the Kansas City Royals. 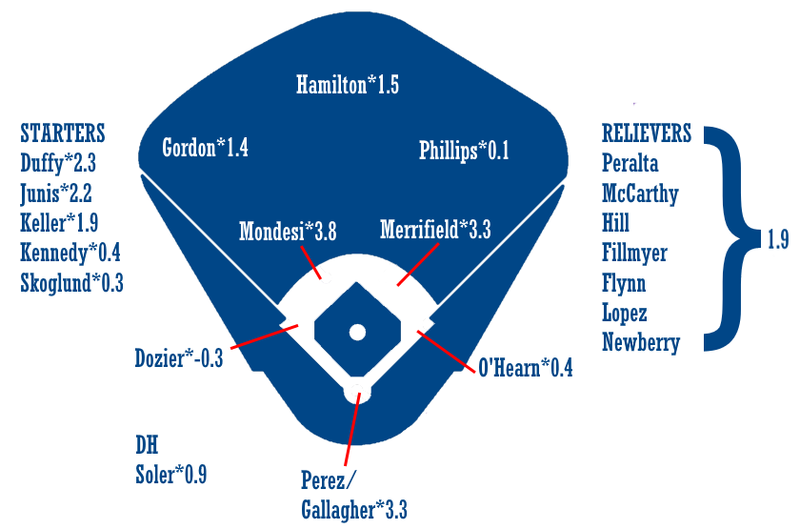 The Royals have an extremely bifurcated offense, with three players projected to be solidly above league-average in Adalberto Mondesi, Salvador Perez, and Whit Merrifield, and a fairly large gulf before the next tier of KC hitters. If the Royals were really going the full rebuild route, you’d see Perez and Merrifield — entering their age-29 and -30 seasons respectively — on other teams’ lists, but the Royals seem content to go the “sorta” rebuild route. Given how thin their talent is, it’s hard to see them having much success going this route and as such, Perez and Merrifield are likely to be either in their declines or in other organizations by the time the performance matters. Winning 72 games instead of 64 in 2019 isn’t going to jumpstart anything. I’m sure there will be some gnashed teeth about O’Hearn’s projection, given that he hit .262/.353/.597 in the majors in 170 plate appearances in 2018. He also had a .713 OPS in 406 PA in the Pacific Coast League, which is abysmal for an offensive prospect. This group won’t be as bad as some people think in 2019, and it wouldn’t take a lot of breaks for the team to achieve their pointless Quest for 75 Wins, which is a little like bragging to your drinking buddies that you can deadlift 125 pounds. Danny Duffy isn’t a lost cause and Brad Keller was good enough in 2018 that it couldn’t all have been a fluke. ZiPS absolutely loves Richard Lovelady, but the rest of the bullpen is a big digital yawn. The Trevor Oaks projection isn’t exactly impressive, but I can’t remember the last time ZiPS didn’t actually hate a pitcher with as low a strikeout rate as he is projected to have. Troubling and not seen in full here is that ZiPS simply projects very few of the hitting prospects in the upper levels of the organization as good bets to be relevant by the time the Royals are good again. It’s essentially Adalberto Mondesi and Nicky Lopez. Khalil Lee and Emmanuel Rivera are the only two other offensive prospects on this list for whom ZiPS gives even an over/under of three WAR over their major league careers. Now, it’s not quite as bad as that considering a couple of the names I’m not yet projecting are Seuly Matias and Nick Pratto, but it’s certainly less than ideal for a team that really ought to be 2 1/2 years into a rebuild by now. We hoped you liked reading 2019 ZiPS Projections – Kansas City Royals by Dan Szymborski! The aggregate OBP of this team could be historically bad. Pretty amazing when two of their three *best* hitters are sub-.300 OBP.